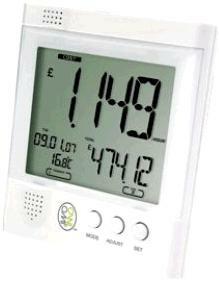 At the start of 2009, two new wireless energy monitors were put on sale – the Efergy Elite and OWL CM119. Ostensibly with identical features, in this article we will take a look at both products to find the differences, advantages, and disadvantages of each. Click here to view our new comprehensive guide to Wireless Electricity Monitors with the latest models and up to date pricing. OWL CM119 is supplied with an A3-sized Quick Start Guide. One side goes through the steps to physically set up the wireless energy monitor – inserting batteries, locating the domestic power supply cable, etc. The other side shows the steps required to programme the remote monitor with time, date, tariffs, and costs etc before its first use. The remaining instructions (the so called advanced settings) are printed in the middle of what is a very limited 10 page printed instruction booklet. The design and wording of the OWL printed materials are quite technical – i.e. written by an engineer without much thought about how understandable they really are for the typical end user. The quick start guide is relatively well illustrated, but lacking in clear explanations, and the instruction booklet is your typical unreadable gadget instruction book. Efergy Elite on the other hand is supplied with an excellent 18 page printed instruction booklet. This is very well illustrated and much much clearer and easier to understand than the OWL’s printed instructions. The Efergy booklet is competely readable from front to back, and after you’ve read it, you really will understand how to set up the Efergy Elite. From opening the box to having everything up and running, the process is made much more pleasant thanks to the quality of the provided instructions. Additionally Efergy Elite is supplied with an 18 page printed energy saving guide which is excellent and also includes an electricity data logger – a chart which you can fill in each week (for one year) with your electricity usage data. The back of the OWL instructions has far more limited advice presenting just details of how you can “save money with the OWL 10-step plan” – 10 ways to save electricity (e.g. change lightbulbs etc.). Overall the installation process for both products is the same except that the wireless transmitter supplied with OWL has a battery bay which can only be accessed using a very small screwdriver (4 screws to remove) which is a bit annoying – more so if you don’t have a suitable screwdriver to hand. OWL is supplied with the necessary 6xAA batteries (good quality Energizer Alkaline) whereas the more expensive Efergy Elite is sold batteries not included. Both units can be powered with renewable batteries – three for the transmitter and three for the wireless display module. The sensor clip for the Efergy unit is approximately 50% narrower than that provided with the OWL, and therefore proved easier to clip on at our test location. This is only likely to be an issue with the new style digital electricity meters which are smaller than the old style of meter resulting in the cables being much closer to one another and also to the wall. The displays on both the OWL and the Efergy Elite remote monitors show a wealth of information, and are both very well laid out. The screen on the Efergy Elite remote monitor is not as easy to read as that of the OWL. From a distance it can appear a bit blurry, and from close up it is not always easy read the numbers accurately. The main part of the display on the OWL (which shows the most important item – e.g. instantaneous power usage) is larger than on the Efergy display. Items such as the date and temperature are very small, but these are infrequently looked at anyway. However, OWL displays the measurement units and the current history mode (e.g. LAST WEEK, THIS QTR) in a tiny font. Therefore in day to day use when glancing over at the monitor, OWL CM119 is the best, but when using any of the accumulated history functions, Efergy Elite is better. The OWL has three main buttons: MODE, ADJUST, and SET. Efergy has four: history, bwd (back or down), fwd (forward or up), and mode/set. These buttons are used (following the provided instructions) to access all of the functions and to programme in the settings. In both cases they are relatively intuitive to use and fun to play around with. One annoyance is that the OWL unit beeps loudly every time a button is pressed. The OWL remote monitor displays the current temperature which is quite useful (for deciding whether you really need to turn on the central heating!) and is not a feature of Efergy. Efergy has a green backlight which is activated for five seconds when any of the buttons are pressed (cleverly only during the evening or night). This makes it easy to check that you have switched everything off in the house before you go to bed. The build quality of the OWL CM119 is just slightly better than that of the Efergy (i.e. it feels more robust and the screen is better quality), but the difference in build quality is nowhere nearly as pronounced as it was between Electrisave (the original OWL) and the original Efergy – i.e. the new Efergy unit is better built than the old one, but the new OWL is not as solidly built as Electrisave. OWL is supplied with a mounting bracket and fittings which enable the wireless transmitter located by the electricity meter to be wall mounted – very useful. Efergy Elite on the other hand is not AND has very rounded corners (it looks like a slightly used bar of soap!) which makes it a little tricky to sit on a surface – but nothing a blob of blu-tac won’t resolve. At present (Feb 2009) Efergy Elite is 20-30% more expensive than OWL with the OWL available for around £30-35 and Efergy Elite from £40-50. Both the OWL CM119 and Efergy Elite are excellent products. They are easy to set up and use, and both have excellent cumulative history functions which allow you to check out your (ever decreasing hopefully) electricity usage. It is very difficult to recommend one unit over the other since each has its own advantages and disadvantages. If price is the primary concern then go for the OWL. If you have more than two price tariffs then you have to choose OWL (as Efergy can be programmed with only two tariffs compared to the four of OWL). If you are not technically minded then you will certainly appreciate the clear and simple instructions provided with Efergy Elite, however you’ll only set the monitor up once after which you are not going to spend much time reading the instructions again. OWL is a bit better equipped being as it is supplied with batteries and a wall mounting bracket for the transmitter. However, if you plan to use rechargeable batteries then you may not be too happy to receive disposable batteries with a green product. Both Efergy Elite and OWL CM119 are available best priced from Ethical Superstore. Click here to buy Efergy Elite now, and here to buy OWL CM119 now.